Made for the ultimate sports fan, you will be proud to show where your loyalty lies with this impressive stool from Holland Bar Stool Co. this contemporary L8B1 University of Kansas stool has a single-ring black wrinkle base with a 5 inch scooped cushion that conceals the swivel for an exceptionally clean look. Holland bar stool uses a detailed screen print process that applies specially formulated epoxy-vinyl ink in numerous stages to produce a sharp, crisp, clear image to ensure a quality reproduction of your favorite team's logo. You won't find a higher quality logo stool on the market. The frame is made from commercial quality steel that is strong and durable, and is powder-coated to guarantee a long-lasting, rich finish capable of withstanding the abuse of your rowdiest of friends for years to come. Only solid Mig welds are used to ensure the integrity of the structure. 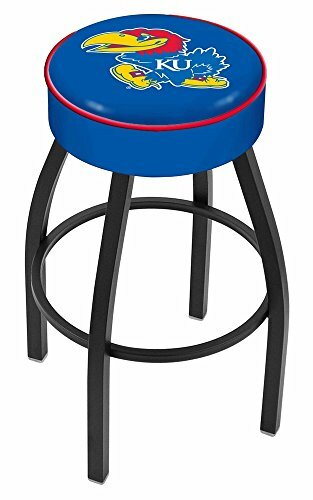 If you're going to finish your bar, game room, or man cave do it right- with a stool from the Holland Bar Stool Co. If you have any questions about this product by Covers by HBS, contact us by completing and submitting the form below. If you are looking for a specif part number, please include it with your message.